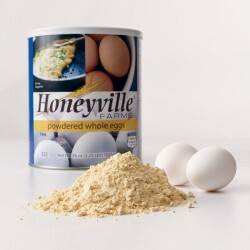 Honeyville's Powdered Whole Eggs are produced though a special process designed to provide a free flowing powder that has been pasteurized for your safety. Originally developed for use in the military, our whole egg powder, when blended with water, reconstitutes into a product similar to fresh whipped eggs. These reconstituted eggs may then be used as a direct substitute for fresh eggs. One 2.25 pound can of Powdered Whole Eggs is equivalent to about 81 to 90 Large Fresh Whole Eggs. Our whole egg powder is non-perishable and requires no refrigeration and is ideal for camping, travel, and long-term food storage. This product may be stored for up to 12 months opened, and 5 to 10 years in airtight sealed cans.